"She Sleeps Tucked Away and Comes Out to Play"
that I am missing from the list. 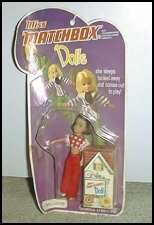 The Matchbox people are not famous for their action figures and dolls. They are better known for their wholesome alternatives to Mattel's Hotwheels. and doll lines including Fighting Furies, Pee Wee Herman, Suky and Miss Matchbox. come in handy. You have to fold her like a taco to stuff her into her box. if not dated, action themes. scarce they seem to be. These dolls must be special because I am having a hard time digging up information about them. Does anyone else remember these?